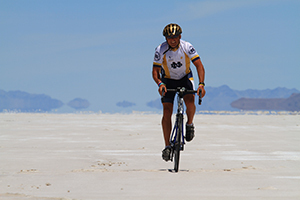 On May 27 (Wednesday), Gregory P. Crawford, William K. Warren Dean of the College of Science and professor of physics at the University of Notre Dame, will embark on his fifth cross-country bicycle ride to raise awareness and funds for rare disease research at Notre Dame. This year’s Road to Discovery will take Crawford on a 3,500-mile journey from Long Island, New York, to Pebble Beach, California. He will arrive at Pebble Beach on June 26 in time for the annual Parseghian Classic golf tournament benefiting Niemann-Pick Type C (NPC) disease research. NPC is a rare and deadly cholesterol storage disorder that primarily strikes children before or during adolescence. NPC causes cholesterol to accumulate in the body’s cells, leading to fatal neurodegenerative issues. Legendary Notre Dame football coach Ara Parseghian lost three of his grandchildren to NPC. With previous research funding from the Ara Parseghian Medical Research Foundation and the Charles Edison Fund, a group of Notre Dame researchers and their collaborators identified medications that have shown promising results in treating NPC disease cells in the laboratory. The treatment is currently in clinical trials at the National Institutes of Health, which are supported by the money raised during the 2013 Road to Discovery. Since 2010, Crawford has successfully completed four bike rides to raise money for NPC research, traveled more than 11,200 miles, attended over 60 Notre Dame alumni club events and raised $1 million for NPC research. In 2010, he biked from Tucson, Arizona, to Notre Dame, Indiana. He then rode from Boston to Dallas in 2011. The following year, he cycled from Boston to Pebble Beach, and in 2013, he biked from Long Beach, California, to Baltimore. Expanding Crawford’s fundraising efforts, this year’s Road to Discovery will also raise funds for research for other rare diseases, including ones that affect young children, nonketotic hyperglycinemia (NKH) and NGLY1 deficiency. NKH is a condition that prohibits the body from properly breaking down the amino acid glycine, which can lead to developmental issues, seizures and brain damage. NGLY1 deficiency is a disorder that causes the accumulation of glycoproteins in the body, which can result in developmental delays, abnormal tear production and liver disease. The goal of this year’s Road to Discovery is to raise $1 million for research for rare diseases at Notre Dame’s Boler-Parseghian Center for Rare and Neglected Diseases. During the month-long bike ride, Crawford will attend many events, which include events with the Notre Dame Clubs of Mid-Hudson Valley, Philadelphia, Fairfield County, Harrisburg and Gettysburg, St. Joseph Valley, Quad Cities, Iowa City, Des Moines, Denver, Salt Lake City, Sacramento and San Jose/Silicon Valley. Crawford will write a daily blog about his journey. The blog and full ride schedule can be found at roadtodiscovery.nd.edu. The 2015 Road to Discovery is sponsored by Ivy Court Inn & Suites, 1-800 Flowers, Aegerion Pharmaceuticals, Amicus Therapeutics, Notre Dame Federal Credit Union, Retrophin and Rein Juicery. Originally published by Stephanie Healey at news.nd.edu on May 18, 2015.